The understanding of hydration is essential to the physicochemical approach of oxides. The molecular or dissociative character of the adsorption of water, the effects of structure and stoichiometry and equilibrium forms have been studied in the case of MgO powders and MgO(100) thin films prepared in a controlled manner. - Signatures of the hydroxylation of <100> steps of MgO (100). Smoke and thin films of MgO enabled the study of hydroxylation <100> steps. Two bands observed at 3480 and 3710 cm-1 on the hydroxylated smoke are similar to those identified by HREELS on a MgO(100) film deposited on Ag(100) under vacuum. Hydroxylation of MgO <100> steps - IR spectra of powders (black), HREELS on thin films (red) and DFT calculation. A first : the calculation attributes these bands to Mgsurf-OHads and Osurf-Hads that cover <100> monoatomic steps, the most common site of MgO (100) (right figure). L. Savio, M. Smerieri, A. Orzelli, L. Vattuone, M. Rocca, F. Finocchi et J. Jupille, Surf. Sci. 604 (2010) 252 [link]. 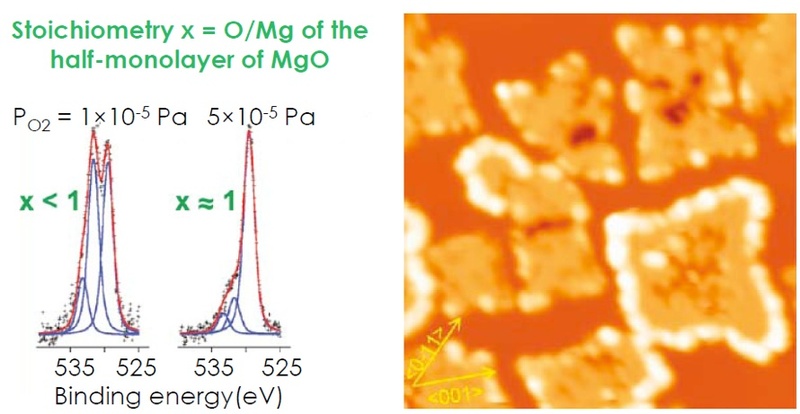 - Whatever the medium, MgO (100) does not dissociate the isolated H2O molecule. Observed by experiment and in contradiction with calculations, the exalted reactivity of MgO(100) islands on Ag(100) was debated. It was attributed to specific effects of the atomic layer thickness of the films : force image and charge transfer. In collaboration with the group of Mario Rocca, Genoa, it has been shown to be due to sub-stoichiometric MgO. Compared to previous work, observation shows that, whatever its medium, MgO(100) does not dissociate the isolated H2O molecule. These observations were supported by numerical simulations that were used to determine the relative values ​​of hydroxylated (100), (110) and (111) surface energies. Hydroxylation of MgO(100) / Ag(100), non-stoichiometric and stoichiometric thin films - Left : O 1s spectra of both - Right : image 33×33 nm2 of the latter. G. Cabailh, R. Lazzari, J. Jupille, L. Savio, M. Smerieri, A. Orzelli, L. Vattuone et M. Rocca, J. Phys. Chem. A 115 (2011) 7161 [link]. - Equilibrium form of hydroxylated MgO crystallites. It had long been predicted that the (111) face of MgO is the normal orientation of MgO under ambient conditions because of its low energy. However no direct evidence has been provided. 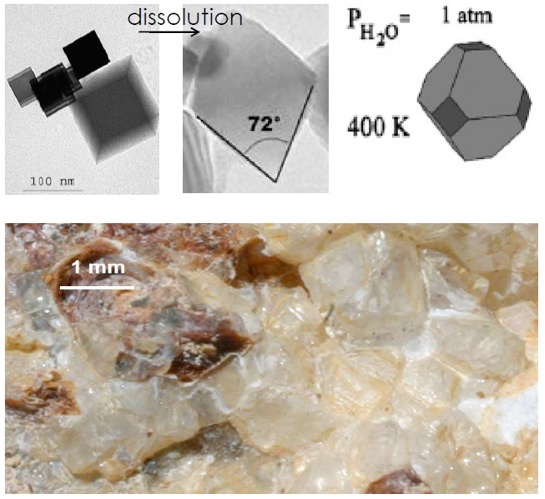 This is what motivated the study of aqueous dissolution of cubic MgO smoke nanocrystals that offer defined coordinations sites (facets, edges, corners : 5, 4 and 3). In the experiment, (110) truncation appear first due to kinetic reasons. Then, demonstrating the relevance of the predictions, cubes exhibiting (100) facets become octahedra with (111) facets with shapes similar to that of periclase crystals. These observations were supported by numerical simulations that were used to determine the relative values ​​of energy surfaces (100), (110) and (111) hydroxylated. Top, formation of octahedra enclosed by (111) planes by aqueous dissolution of nano-cubic MgO smoke exposing (100) faces - Top right, numerical simulations – Bottom : photograph showing periclase crystallites identical to that of the crystallites of MgO obtained by aqueous dissolution. R. Hacquart et J. Jupille, Chem. Phys. Lett. 439 (2007) 91 [link] ; J. Cryst. Growth., 311 (2009) 4598 [link]. P. Geysermans, F. Finocchi, J. Goniakowski, R. Hacquart et J. Jupille, Phys. Chem. Chem. Phys. 11 (2009) 2228 [link] .